第１回　Presentation: Origami in the real world! This origami workshop attempts to inspire students to (a) explore research possibilities of origami, and (b) challenge themselves in making models beyond the traditional folding techniques.During the first session of the workshop, we introduced two directions in origami research, namely, curved origami and rigid origami. As the name suggests, curved origami is about folding along a curve. The questions that arise are which curves can be folded and what surfaces are obtained as a result. These questions are investigated from the point of view of differential geometry. In rigid origami, metallic plates are connected with hinges. The synchronized motion of the plates is carefully designed to be able to fold the metallic structure into a compact size. Examples of applications of curved origami and rigid origami were given, e.g. car industry, art sculpture, robotics, etc. 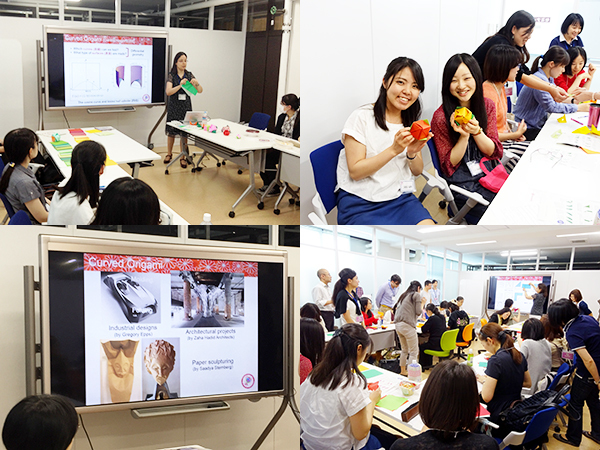 Following the presentation, we instructed the participants on making an origami model, namely a cubic rose. Elements from nature are abstracted into 3D geometric structures, in this case a rose is abstracted to origami cube. After adding a few details, the cube suggests a rose, without falling back into mere imitation.